I once spent a couple days in Madrid. I had a guide book with several detailed maps, a phrase book, a notebook, and a stash of Euros that my Mom pushed into my hands before I got on the plane. Every night in my hostel, I'd pore over all my materials and make a detailed plan (with notes!) of where I was going and what I was going to do the next day and what simple Spanish words and phrases might come in handy. When I arrived at Narita Airport on Thursday, I had zero of these things. I had a bunch of Euros to change in to Yen (cash is still king in Japan), a couple pages of instructions from Takemi on how to get to to my hotel, and a reservation for a rented cell phone. 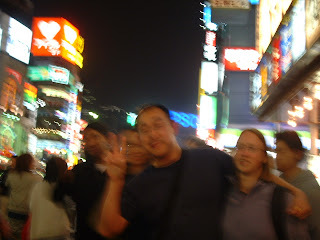 We got around Tokyo mostly through the subway (more accurately, either Takemi or Peter would herd us through the subway). Subway ticket prices in Tokyo are based on distance traveled. 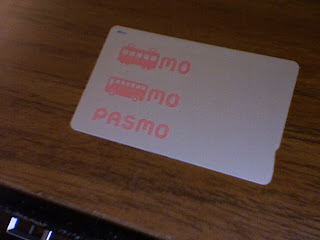 In addition, there is more than one subway operator, so it's lucky for us that just recently they've created a unified stored-credit subway card, Pasmo. And it's a a prox card too, so no worrying about which way to insert it! The only drawback is that it's the exact same shade of gray as our hotel key cards and I constantly attempted to use it to open my hotel room. One last almost neat-o technology note. I have a SkypeIn number. That means people in the know dial a local suburban Chicago number and my computer rings -- the caller pays whatever local suburban Chicago rate, I pay for the subscription for the number ($30/year). This alone already freaks me out (you call a number, my computer rings?!). But Skype will also forward incoming calls to up to 3 different phone numbers. In principle, this means that someone in the States could call me for free on their cell minutes and my rented Japanese cell phone would ring and Skype would charge me only their usual minute rate (2 cents/minute). Awesome. Sadly, it wasn't to be. Some technological glitch made is so I would get many a 'missed call' notice but my phone would never actually ring when someone called my SkypeIn number.